Composites World’s High-Performance Fibers (HPF) conference was held Nov. 9-10 near The Boeing Co.’s 787 production campus in Charleston, S.C., a city at the center of a regional upswing in composites R&D. One of the top attractions was apreconference session. Prof. Amode A. Ogale, director of Chemical and Biomolecular Engineering at Clemson University’s Center for Advanced Engineering Fibers and Films (CAEFF, Clemson, S.C.), revealed the results of research into “Carbon Nanotubes and Nanofibers: Modification of Electrical Properties of Polyolefin and Thermotropic Liquid Crystalline Polymers.” His research centered on the use of nanotubes/nanofibers to introduce practical levels of electrical and thermal conductivity into polymers by reaching a “percolation” threshold, beyond which nanostructures, introduced into a polymer as an additive, are of sufficient length and percentage of concentration to dramatically increase the polymer’s thermal or electrical conductivity. Of interest to the composites community, Ogale set the stage for his presentation by deflating unrealistic expectations in regard to nanocomposites. Unlike carbon fiber, which can be had in continuous form, carbon nanotechnologies, at their best, are discontinuous. Ogale noted that yarns have been constructed using carbon nanotubes (CNTs), but, like cotton fiber yarns, they are intertwined but still discontinuous structures. “It is not yet possible to produce a nanostructure in a continuous form, analogous to a polyester filament,” he explained, noting that their capabilities in terms of developing tensile strength in combination with a polymer matrix have been oversold because their strength is limited by the bonds between the nanotubes. Consequently, he said, it is unlikely we’ll see them used soon — as some predict — in nanoribbons that, for example, tether satellites to Earth in orbit, permitting the ribbon to be used as an elevator or railway for transport (Compare Ogale’s comments with the predictions in “From specialty fillers to space elevators,” under “Editor’s Pick,” top right). In fact, in discontinuous form, nanotubes are like other fillers. They tend to reduce the mechanical strength of the polymer, rather than enhance it. The exception is functionalized CNTs. They can increase the strength of conventional carbon fibers because they can be attached to the fiber surface, radiating away from the fiber’s axis, and enhance the surface characteristics of the fiber and, as a result, improve the fiber/resin bond (read more about how CNTs improve fiber/resin bonds in “The key to CNTs: Functionalization,” under “Editor’s Picks”). Also unlikely is the use of CNTs independently in large quantities because, thus far, they cannot be processed continuously. Instead, they are made in batch processes that tend to be slow and expensive (however, see “Near commercialization: CNT yarn, tape and sheet,” under “Editor’s Picks”). CompositesWorld conference director Scott Stephenson introduced conference chair Dana Granville, senior materials engineer for the Materials Manufacturing Technology Branch of the Weapons and Materials Research Directorate at the U.S. Army Research Laboratory (ARL), Aberdeen Proving Ground, Md., and cochair David Fecko (AGY Holding Co., Aiken, S.C.). Granville, who has chaired HPF events since 2006, noted that Army researchers have seen a revolution in ground vehicle armor capability due to improvements not in the fibers themselves, but in the processing techniques. He said that Aberdeen’s ARL Rodman Materials Research Lab is (as Ogale observed) working with nanotechnology modifiers that enhance the mechanical interface between fibers and resins. The ARL team is studying the mechanics of failure and working with Kansas State University and the University of Michigan to develop databases. He noted that work continues at the U.S. Army Natick Soldier RD&E Center (NSRDEC, Natick, Mass.) on composite combat helmet technology and introduced Dr. James Zheng, chief scientist and project manager, Soldier Protection and Individual Equipment, in the Army’s Program Executive Office. As helmet design has transitioned from molded thermoset to thermoformed thermoplastic composites, Zheng said the big question is the effect of deformation on fiber performance. Experiments so far indicate that after fibers are stretched during thermoforming, their performance improves compared to their performance in flat panels, a phenomenon his researchers cannot explain. And when hard armor is used as backing for soft armor, a too-strong adhesive bond between hard and soft layers can degrade stopping power. How, Zheng asked, do researchers find the sweet spot for adhesive tenacity? A first-day highlight was a discussion by Marcia Price, president, Vector Strategy Inc. (Southern Pines, N.C.), of “The Outlook for High-Performance Fibers in U.S. Military Ground Vehicle Armor.” Her talk covered vehicle armor for military ground vehicles and the demand outlook for specific armor applications and fiber types through 2020. Price summarizes her predictions in our “Market Trends” column, in this issue. See “The military ground vehicle ….” under “Editor’s Picks.” Rob Wassem, VP of business development, LCOA Composites Inc. (Laminating Company of America, Lake Forest, Calif.), told attendees how LCOA is using lightweight hybrid fabrics to reduce weight and minimize spall or backside deformation in hard armor. On a police riot shield, for example, backside deformation is a risk because a hand or arm is holding the shield. The answer, says Wassem, is Dead Stop, a hybrid of materials. LCOA and another company invented FORTIS — a hybrid of high-density polyethylene plus other fibers (aramid and others) — for military shelter panels because polyethylene alone is too expensive. The hybrid led to the development of Dead Stop for shields. Wassem said that steel shields weighed 35 lb (nearly 16 kg) and were replaced by Kevlar and other fiber constructions that weighed between 15 and 20 lb (6.8 kg and 9.1 kg). A Dead Stop shield weighs only 14 lb/6.35 kg but is rated for NIJ Class 3a threat level. Wassem commented, in response to a question, that the armor market on the military side is waning, but civilian demand, both local and federal, is up, and he reported that there are federal funds available for local personnel protection procurement programs. Keith Harrison, applications manager, life protection, DSM Dyneema (Geleen, The Netherlands), outlined the use of trademarked new Dyneema unidirectional ultrahigh molecular weight polyethylene (UHMWPE) fibers in a woven-tape format to reduce the weight of vehicle protection in military ground vehicles. The product features tapes 3.5 to 4 inches (90 mm to 102 mm) wide. Applications include radomes that need ballistic protection, hard inserts for vests, hard chest protectors and helmets. Harrison emphasized the utility of woven tapes in military ground vehicles, where steel armor weight interferes with vehicle performance (Dyneema is 20 percent the weight of steel), and airborne vehicles. The product resists small arms fire (9 mm and .357 magnum) and rifle fire (NIJ level 3). In a shield, it weighs only 1.4 lb/ft2, with low backside deformation. To offer the same protection as UHMWPE does against a 20-mm/0.79-inch fragment, Harrison says aramid is 20 percent heavier, S-glass is twice the weight and steel is six to seven times heavier. Although Dyneema does burn, Harrison said it meets industry flame, smoke and toxicity (FST) standards and emits no noxious gases in smoke. In a hybrid construction with other materials and fibers, it can be very low in flammability. HPFs for niche applications Peter Davis, the OEM sales manager for Engineered Specialty Fabrics at recently rechristened Saint-Gobain ADFORS America Inc. (formerly Saint-Gobain Technical Fabrics, Grand Island, N.Y.). ADFORS, he explained, stands for “adding force.” Davis showcased the company’s three-dimensional laid-scrim reinforcements. Developed for high-performance sails on racing yachts, these lightweight fabrics can be made faster than wovens, he claimed, “so the costs are lower by definition.” The scrims feature a wide variety of yarns — aramids, carbon (3K, 6K, 12K and some 24 K) and some basalt fiber, and they can be made in 0°/90° and other angles ranging from 20° to 85°. Under the trade name Engineered Specialty Fabrics (ESF), these constructions are marketed to aerospace, military, marine and alternative energy markets. Davis said ADFORS is already working with surfboard and ski manufacturers and producers of composite pipe. Skis feature spread-tow carbon with ADFORS scrim, trading a slight weight increase for cost reduction. Mark Shioleno, global business manager aerospace and defense, AGY Holdings Co., introduced “L-Glass: Low Dielectric, Low Loss Fibers.” Developed for electronics applications to reduce dielectric loss, L-Glass is entering the aerospace market as a less-expensive alternative to quartz fiber in radomes, where the key material property is signal transparency. Although quartz (almost pure silica) performs best here, it is four times the cost of E-glass, which has unacceptable dielectric loss in radomes. L-Glass bridges the cost/performance gap between quartz and E-glass with dielectric properties slightly below the midpoint between the other two. 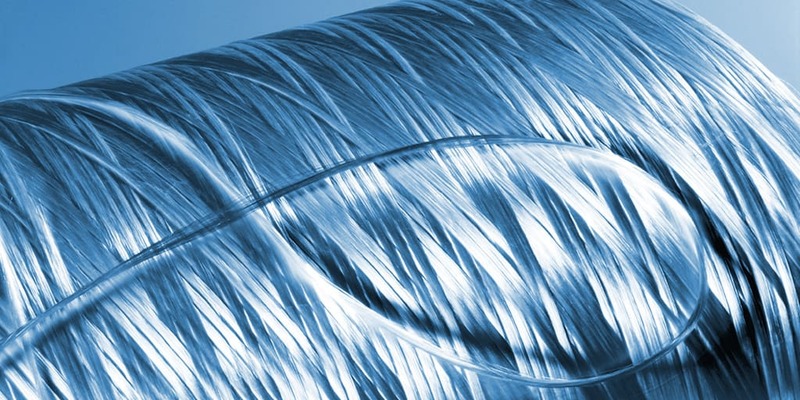 L-Glass provides acceptable signal transmissivity at a lower cost. Shioleno suspects that military programs are unlikely to give up quartz, but he believes there is a market for the new fiber in commercial aircraft. Also new is DE75 947, an E-glass fiber sizing that does not have to be removed and replaced after weaving. Previously, the sizings that helped in weaving interfered with resin adhesion and were removed, via a heat process that can degrade fiber performance. The new sizing needs no removal and enhances resin adhesion. Don Wigent, technical product manger, 3TEX Inc. (Rutherfordton, N.C.), discussed the application of his company’s 3D Weaving technology to large-scale composite structures, where sheer mass, high ply count, layup time/labor and multiple debulking steps are posing processing and cost challenges. The centerpiece of the discussion was RapidRoot Infusion for the root ends of wind turbine blades (RapidRoot Infusion was examined recently in HPC’s sister publication,Composites Technology. See “3-D preforms: Fast, efficient blade-root manufacture,” under “Editor’s Picks”). Robert Stratton, owner/president of Stratton Composites Solutions (Dayton, Ohio), outlined the history of Composite Technology Investors (CTI), which brought together six experts in their fields (all friends) “to take what they’ve learned separately and try to do better.” CTI’s partners share their experience in armor, going back to army-oriented research at the University of Delaware on Humvee armor and blast shields. They acquired Dayton-based Vector Composites (and its armor business) in 2010 and recently purchased the first commercial Quickstep molding system, an out-of-autoclave method developed by Quickstep Technologies (North Coogee, Western Australia). The system is designed to rapidly heat, cool and control exotherm (40°F/min ramp-up and ramp-down) while applying high consolidation pressure to laminates. Vector has an F-35 contract and has reduced part cure to 3.25 hours (previously 13.5 hours via autoclave) with the Quickstep process. A second business, Composite Utility Solutions, produces a patented multisection filament-wound/oven-cured utility pole to replace standard but now out-of-favor creosote-treated 45-ft/13.7m wood poles. The advantages of the new pole include the option to replace only a damaged section, not the entire pole; easier transport (pickup vs. flatbed truck); a lighter weight of 800 lb/363 kg, vs. 3,000 lb/1,360 kg for steel and 1,500 lb/680 kg for wood; and no corrosion (expected 140-year service life). And unlike pultruded poles, Composite Utility Solutions’ poles are tapered to accommodate the rope-type climbing techniques used by some utility service personnel. In “KEVLAR: Proven Strength Poised for Growth,” Matthew Paul Reinhardt, North American marketing manager for DuPont Protection Technologies (Richmond, Va.), revealed that the decline in demand for aramid-based military armor is permitting his company to refocus on aspects of the commercial composites market that were neglected while the company tried to keep up with war-related demand in Iraq and Afghanistan. DuPont, he revealed, is investing $500 million in a Charleston, S.C., facility — the largest capital investment DuPont has ever made in the U.S. — and is adding capacity at its Richmond site. The new plant will increase Kevlar production by 25 percent. Reinhardt emphasized that the Charleston expansion isn’t just “about getting more pounds out, but also about innovation — pressing the limit of what you can do in the market.” The new facility, he noted, “can do things other facilities can’t do.” One of those things is to produce DuPont Kevlar AP (advanced performance) fiber, expected to exhibit 10 to 15 percent better performance in terms of modulus “so you can do more with less.” A lighter denier for the same performance nets a weight reduction, Reinhardt explained, improving fiber conformity to tool radii. That plus inherent flame and impact resistance are expected to make it attractive in jet engine fan blade containment rings and cargo containers. One unusual application is in the case of the new Droid Razr cell phone.